Summer’s over. It ended on August 27, because that’s the morning I had to start wearing a sweatshirt when I got up to make the coffee. Though the days have continued to be sunny and warm, the nights are chilly--close-the-windows chilly. It’s time to think about a new season, time to move forward. But it’s also time to recap the summer from the assistant aubergiste’s point of view. Here, then, are some of the highlights and lowlights from the Summer of 2012. Sunshine. Sunshine, sunshine, sunshine. I haven’t looked up the records yet, but this must have been one of the sunniest summers ever in northern Vermont. Beginning in May, and continuing through the Labor Day weekend, the weather has been astonishingly sunny. The resultant bump in business has been welcomed, and it makes an innkeeper’s life easy. The pool is gone. Finally. I’ve wondered if the pool’s demise was directly linked to the long stretch of hot, sunny weather we experienced this winter--an act of chlorinated hubris. But that’s crazy talk. In it’s place is my attempt at a new lawn. There may yet be some voodoo going on down there, because half the seed didn’t sprout because of a brief period of torrential rains, the only such interlude we had all summer. Oh, and the transmission on the riding mower bit the shed, leaving me with amber waves of grain for a back yard. Empty nesters. Both boys were away for the entire summer. One was at the New England Music Camp, one had a job in France for the summer. Aside from enduring the endless winks, nudges, and ribald comments about what the innkeeper and I would be doing with our freedom all summer (umm, working all day, every day; we’re innkeepers), we were missing the boys--and I was missing dinner. Without 350 pounds of teenaged boys to feed, our food bill--and our food offerings--was slashed dramatically, leaving us wondering what to eat each night when eight o’clock rolled around. I was looking forward to the return of the boys, if only for the protein boost I’d receive, but one of them came back a vegetarian. Go figure. Health, and the fragility thereof. My father suffered a stroke this summer, turning me into a Boston-to-Stowe commuter. While he’s made a tremendous recovery, and is back home on his own, episodes like this are terrifying--not so much for their natural consequences, but for their financial and social implications. Cycling. One of the greatest benefits of a sunny summer is an uninterrupted flow of perfect cycling days. Chantal and I had our pick of times during any given day to go for a bike ride. I put about a hundred miles a week on my bike, burning through several inner tubes and wearing through my back tire. And I haven’t even tapped Stowe’s new mountain bike trail system, which is one of the best in the country. A new book. My second book, Creative Writing in the Real World: A Reader for Writers, was published by New Plains Press. While the book exposes my love of the creative process and my ability to actually write, it also reveals my shortcomings as a marketer. I’ve sold out of the first box of books the publisher sent me, but I’m a horrible self-promoter, so don’t look for any readings to be scheduled. You can help me out by ordering a copy from my web site. 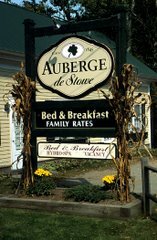 There were many more things that made this a memorable summer around the Auberge, and we’re looking forward to a busy fall foliage season: I predict blazing colors and perfect weather. But the best part of the summer, as always, was the people. We were blessed to meet so many cool people from so many different places. That’s the greatest benefit of this business--the people. Thanks for making it a memorable summer.